I’ve been thinking a lot about water lately. A brutal drought will do that, I guess. The economic and environmental devastation are bad enough. But the fights and fears over Austin’s water supply are making it worse. So this seems like a good time to remember a little history – to take stock of what we’ve accomplished in Central Texas and where we need to go from here. One thing we know for sure: this drought has exposed an outdated, inadequate management plan for our region’s water supply. That spells trouble for our economy, quality of life and future. Fortunately, Austin’s in a strong position to defend its water supply. In 1999, back when I was Austin’s Mayor, we negotiated a historic water agreement with the Lower Colorado River Authority that provides the foundation for everything we’re working hard to protect today. The agreement said Austin’s first 150,000 acre-feet of Colorado River water is free (1 acre-foot equals about as much water as three or four families use over a year), based on Austin’s senior water rights. The city pre-paid the purchase of additional water use from LCRA, up to 201,000 acre-feet. The deal set out pre-payment of a “reservation fee,” allowing Austin to reserve additional water for a total firm water supply of up to 325,000 acre-feet a year. That should cover projected needs through at least 2050 and prevent others from staking claim to the water that Austin will need. And the deal creates a big financial incentive to conserve: Austin won’t pay LCRA again until its annual average use for two consecutive years exceeds 201,000 acre-feet. Initially, it appeared we’d reach that trigger by 2021. But today, thanks to successful conservation efforts, Austin probably won’t pay LCRA for more water until after 2030 at the earliest. So when all was said and done, the 1999 agreement locked-in LCRA’s obligation to supply Austin’s demand for water – even through a drought of record, and even as that demand increases over the next couple of decades. But wait, there’s more: in 2007, as I was coming into the Senate, I helped broker a deal between LCRA and Austin that resolved a number of outstanding water issues, strengthened the 1999 deal, and created a formal partnership between Austin and the LCRA. I’m very proud of both of those deals. 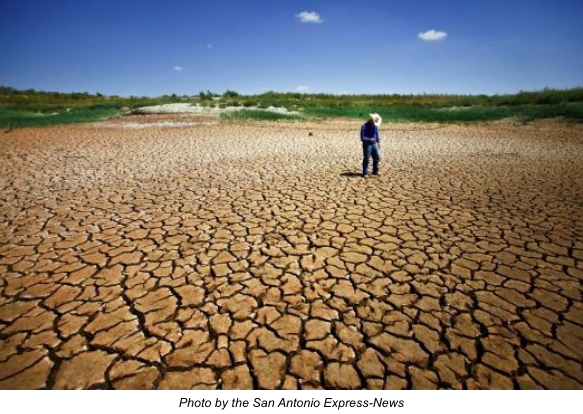 The severity of this drought shows why Austin should be proud too. The Highland Lakes are near historic lows. Water for most downstream rice growers has been suspended. Cities and industries will continue to figure out drought response measures, even as they face mandatory curtailments and potentially huge costs. But because Austin planned – and, more importantly, invested in that planning – we’re in a better position to withstand this drought. First off, the LCRA’s water management plan has got to be updated so it’ll function through this drought.Up until now, the LCRA has reacted to these incredible drought conditions using what are known as emergency orders. Don’t get me wrong – those orders have been essential. But let’s face it: they don’t replace proper planning. Each order brings only temporary relief and way too much uncertainty about what comes next. That makes it harder to do other needed regional water and drought planning. Second, the state has to address the flaws in LCRA’s management plan. In the past, the LCRA has released water from the Highland Lakes for downstream customers that have what are known as “interruptible rights” – rights that get interrupted in a massive drought to protect others with more senior rights. If those water releases threaten LCRA’s obligation to customers who have planned, reached long-term agreements, and paid for firm water rights (customers such as Austin), then LCRA’s management plan shouldn’t allow those releases. Third, we all need to be realistic, and we all need to confront this crisis together. Even after the water management plan is fixed, what’s already happened under an outdated plan can’t be undone. This drought still will probably force cities, companies and communities up and down the Colorado to seek back-up or emergency short-term water supplies in the event that rain doesn’t refill the lakes. Conservation will continue to be essential. But it may not be enough. So it’s imperative that LCRA, Austin and other regional suppliers continue working as partners. With water this scarce, we simply must work together.